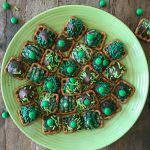 Sweet & Salty St. Patrick’s Day Pretzel Snaps – Everyone loves when I make these for St. Patrick’s Day and when I change around the sprinkles we can enjoy them for any occasion. Make up a batch in no time at all and enjoy! 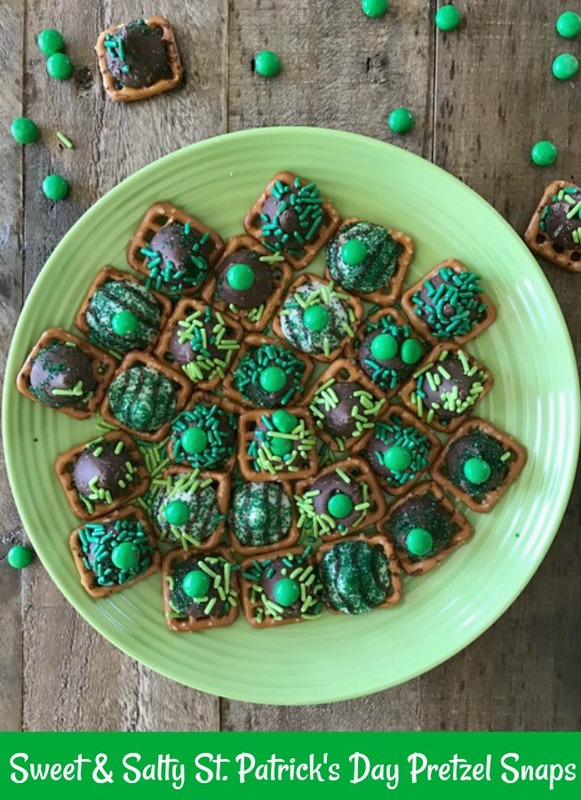 If you have been on this site before you know we love pretzel snaps. There are a bunch for different occasions and holidays. Couldn’t pass up St. Patrick’s Day. With only a few ingredients and a few simple steps you can whip these little snaps up in no time at all. The sweet and salty go so well together. A great combo when you are in a snack mood. These are great for a game day too. Swap your favorite team colors with the sprinkles. Have a happy and safe holiday. Preheat oven to 325 degrees. Line a cookie sheet with parchment paper, set aside for just a few minutes. While the oven is heating up. Unwrap the Hugs and Kisses and get your sprinkles opened, pour into small bowls if needed and have a teaspoon on hand. 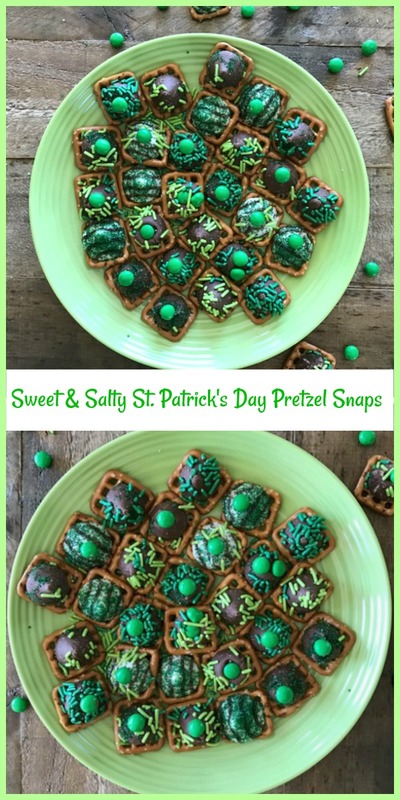 Lay out the pretzel snaps on lined cookie sheet. Place a Hug and Kiss in the center of each snap and bake for about 3 to 4 minutes. You will see the chocolate get shiny. Try not to over heat the chocolate. Take out of the oven and carefully place cookie sheet on cooling rack on counter. Now, toss sprinkles over each chocolate snap. Let sit on counter to cool completely. When they are completely cooled, place in fridge for 15 minutes. then store in an air tight container or zip lock bag. They will stay for up to 4 days on the counter (If they last that long). Enjoy the sweet and salty deliciousness! 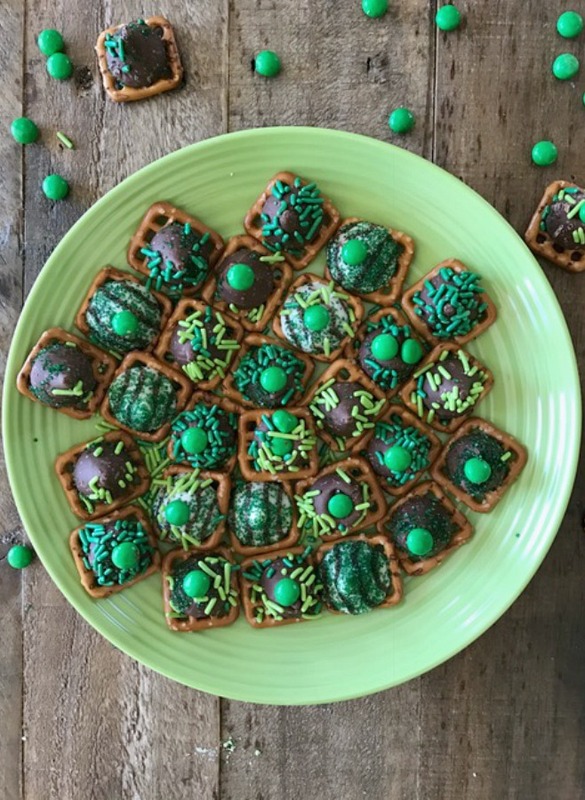 Enjoy these fun and simple treats with the best combo of sweet and salty. Total deliciousness! 1.Preheat oven to 325 degrees. Line a cookie sheet with parchment paper, set aside for just a few minutes. 2.While the oven is heating up. Unwrap the Hugs and Kisses and get your sprinkles opened, pour into small bowls if needed and have a teaspoon on hand. 3.Lay out the pretzel snaps on lined cookie sheet. Place a Hug and Kiss in the center of each snap and bake for about 3 to 4 minutes. You will see the chocolate get shiny. Try not to over heat the chocolate. 4.Take out of the oven and carefully place cookie sheet on cooling rack on counter. Now, toss sprinkles over each chocolate snap. Let sit on counter to cool completely. 5.When they are completely cooled, place in fridge for 15 minutes. then store in an air tight container or zip lock bag. They will stay for up to 4 days on the counter (If they last that long). Enjoy!